From the cockpit of a Cessna airplane, Gary Mowad, a special agent for the U.S. Fish and Wildlife Service, spotted what looked like a dried-out pond in rural eastern Colorado. The banks of the pond were black, so he suspected it was actually a pit for oil company waste. When he drove out to inspect the half-acre pond, he found something far worse. As he expected, its banks were covered with dried oil. But it was the bottom of the abandoned pit that shocked him: It was blanketed with the bones of thousands of birds. Mowad has held dying, oil-cloaked songbirds in his hands. He knows their deaths often are slow and painful. Trapped in these waste pits, raptors, ducks and songbirds can starve to death, suffocate, die of exposure or absorb poisons. He had access to a powerful weapon, too – one that now, under the Trump administration, is gone. 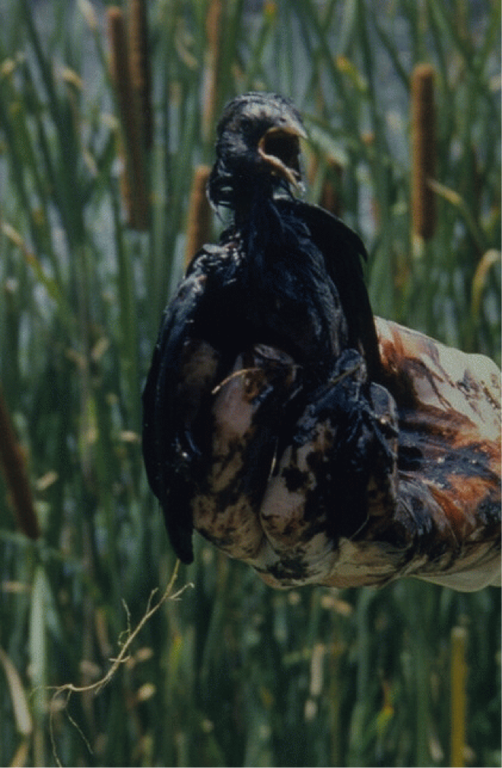 Since the 1970s, federal officials had used the Migratory Bird Treaty Act to prosecute and fine companies that accidentally killed birds with oil pits, wind turbines, spills or other industrial hazards. But a legal decision issued in December by the Interior Department revoked that ability. Wildlife officials predict deadly consequences for migratory birds. The government says millions of birds are killed inadvertently each year by industrial activities. For example, under the new interpretation, the law no longer applies to oil spills. After the 2010 Deepwater Horizon spill in the Gulf of Mexico, which researchers estimate killed more than a million birds, BP paid a $100 million settlement for violating the Migratory Bird Treaty Act, among other fines. 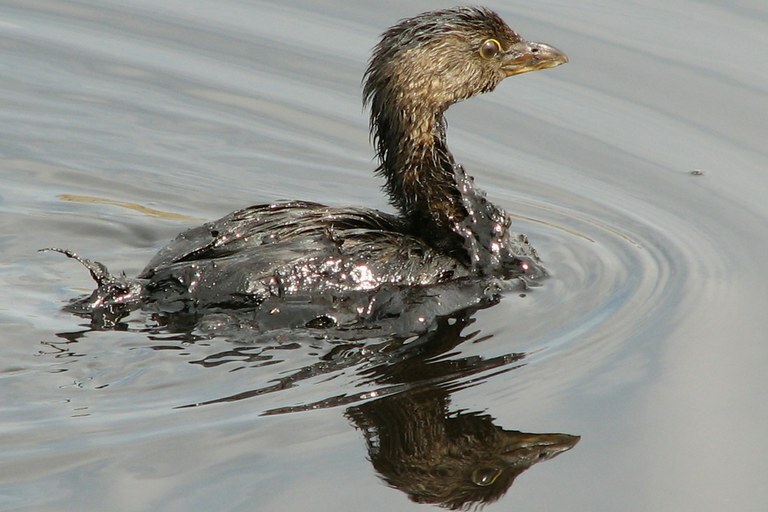 Federal wildlife officials also had used the threat of prosecution to prompt oil companies to cover waste pits with nets, which saved millions of birds. The Interior Department issued its legal opinion after extensive lobbying by industry last year, documents show. An oil industry trade group included it on its wish list and pressed the Trump administration for the decision in emails. Some energy companies and other industries considered the law burdensome, and the Fish and Wildlife Service and Justice Department overzealous in prosecuting cases. President Donald Trump, in a campaign speech in North Dakota in May 2016, said the Obama administration had used “totalitarian tactics” under the Migratory Bird Treaty Act when it prosecuted seven oil companies in the state for killing 28 birds. The decision to revoke the authority stunned former top Interior Department officials who have served presidents from both parties. Department officials from all administrations since the 1970s signed a letter opposing the solicitor’s office’s legal opinion, saying it contradicts the way the law has been implemented for decades and ignores birds’ important role in ecosystems. Reed, 84, has seen the balance between conservation and industry shift over the decades. But he said he never thought a president would reject conservation as much as the Trump administration has – with this policy, as well as other recent decisions rolling back protection of public lands and resources. The solicitor’s office’s opinion, written by Principal Deputy Solicitor Daniel Jorjani, came as no surprise to oil industry lobbyists. Email exchanges and other documents show they have easy access to senior Trump administration officials and used that access to push for the change. In November, seven weeks before the solicitor’s office issued its opinion, a lobbyist for the Independent Petroleum Association of America sent an email to an Interior Department official with the subject line “MBTA,” an abbreviation for the Migratory Bird Treaty Act. “Any word on the solicitor’s opinion yet?” Samantha McDonald, the trade group’s government relations director, asked Timothy Williams, deputy director of the department’s office of external affairs. That email and others between the oil industry and Interior Department officials were released in response to a Freedom of Information Act request from the Western Values Project, a Montana-based nonprofit research group that works to balance energy development with conservation. Another oil industry trade group, the Western Energy Alliance, wrote a wish list of Fish and Wildlife Service regulatory reforms in response to a Trump administration request in August. One of its wishes was a new official opinion from the solicitor’s office that would preclude federal officials from prosecuting companies for inadvertently killing birds. DeVito previously was a partner in corporate law firm Bowditch & Dewey LLP, representing energy companies as well as opponents that blocked a natural gas pipeline in 2016. He also advised political action committees, including a Zinke PAC, for which he was treasurer until he left for the Interior Department in May. Under President George W. Bush, he served as an Energy Department assistant secretary. 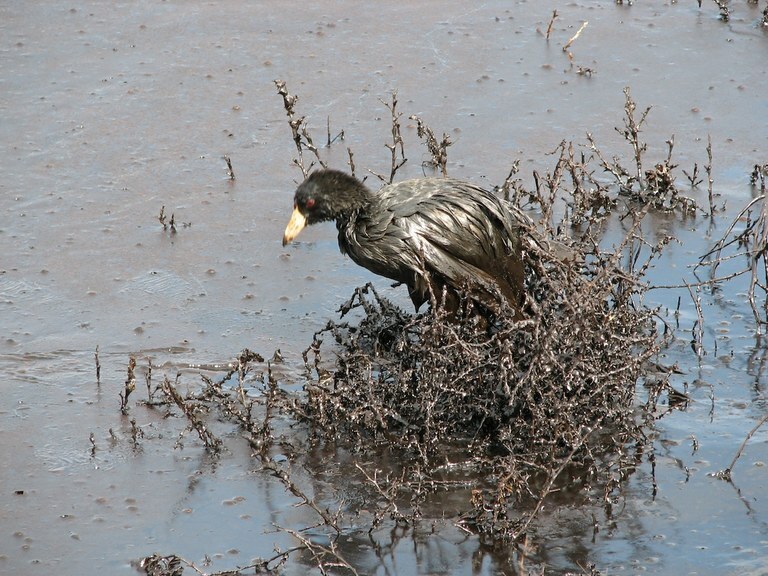 An American coot is slicked with oil on an evaporation pond at a commercial oilfield wastewater disposal facility in 2006 . 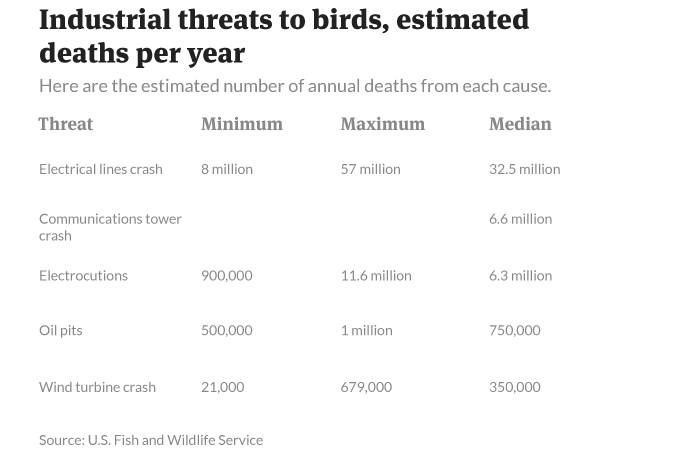 The government estimates that millions of birds are killed inadvertently each year by industrial activities. Other public records analyzed by Reveal from The Center for Investigative Reporting show that 18 other industry groups and companies also lobbied the federal government about the law last year. They include the National Stripper Well Association, representing small companies that operate low-producing wells; the National Ocean Industries Association, representing the offshore oil industry; the Interstate Natural Gas Association of America, a pipeline trade group; and the GPA Midstream Association representing companies that gather and process natural gas. These four groups reported spending a total of $480,000 last year to lobby federal agencies and Congress on issues that included the Migratory Bird Treaty Act. Other industries that lobbied on the bird issue last year include EDP Renewables, a wind energy company; the National Association of Manufacturers; the National Alliance of Forest Owners, representing the logging industry; and several solar companies and electric utilities. Jorjani, who wrote the Interior Department opinion, previously was a lawyer for foundations controlled by brothers Charles and David Koch, fossil fuel billionaires who have financed conservative politicians and fought regulation of the energy industry. Jorjani’s daily calendars, released in response to a public records request by the magazine Pacific Standard, show he met with oil industry lawyers in the months before his opinion was released, but not with bird conservation groups. The topics of the lobbying were not revealed. Conservation groups said the solicitor’s opinion reflects the Trump administration’s open-door policy with the industries it regulates. Many top Trump officials were former industry lawyers and lobbyists. Other top Interior Department officials who have lobbied for oil companies include Deputy Secretary David Bernhardt, Doug Domenech, assistant secretary for insular areas; Principal Deputy Assistant Secretary Scott Cameron; and Tara Sweeney, assistant secretary for Indian affairs. Jorjani, DeVito and other Interior Department officials did not respond to multiple requests for comment. North Dakota oil company CEO Harold Hamm, another billionaire who reportedly has Trump’s ear, was an outspoken critic of the way the federal government was implementing the law. Hamm’s company, Continental Resources Inc., was prosecuted after a dead songbird was found in an uncovered waste pit. A federal judge threw out the 2012 case against Continental and three other companies, ruling that the pits were a “legal, commercially-useful activity.” Trump referred to this case in his 2016 North Dakota campaign speech as an example of “government misconduct.” Other federal courts, however, have upheld similar cases. Sgamma, of the Western Energy Alliance, said the federal government used the law to delay drilling permits and prohibit operators from getting access to their own well pads. However, she said she could not point to specific companies or examples. The industry pressed for the change, she said, because many companies complained about the bird act when the Trump administration asked which regulations were a burden to energy development. Under pressure to avoid prosecution, oil companies about 20 years ago began installing nets to keep birds out of pits and cleaning up oil and other contaminants. More recently, they started storing wastewater in closed containers or injecting it underground so that it no longer threatened birds, according to industry officials, Gary Mowad and other current and former officials of the Interior and Justice departments. The industry also is moving away from open pits altogether, she said, though she provided no data to back that up. “This notion from the environmental lobby that things only happen in a good way if government comes down with a heavy hand is responsible for the huge divide in our country today,” she said. Some oil and gas industry experts said gutting the migratory bird law was not an industry priority. For decades, both Republican and Democratic administrations have used the threat of prosecution under the Migratory Bird Treaty Act to prod various industries to change their ways. In the early 1970s, under Nathaniel Reed’s leadership, the Nixon administration used the law to reduce the large numbers of golden eagles and other raptors electrocuted by power lines. Reed negotiated with power companies to increase the distance between wires to reduce bird deaths. In the early 2000s, fishing boats started attaching weights on long lines that had drowned hundreds of thousands of albatrosses, petrels and other seabirds that dived for the baited hooks. Communications towers that attracted millions of songbirds switched to using blinking lights that significantly reduced bird deaths. And wind companies study birds’ flight patterns and construct their turbines in places where they are less likely to kill them. This bird, found in an oil company waste pit in central Kansas in 1997, had to be euthanized. Trapped birds often die slowly; they can starve to death, suffocate, die of exposure or absorb poisons. The act was powerful leverage, helping Mowad and colleagues dramatically reduce the number of birds that died in oil pits. In the 1990s and 2000s, Mowad flew aerial surveys over eight Western states and plotted the location of hundreds of oil pits on a map. Then he shared the data with the oil industry, warning companies that they had 30 days to clean oil off the pits or cover them with nets to protect birds – or face fines or prosecution. Under the program, which was replicated in other regions, the estimated number of birds that died in oil pits declined from more than 2 million per year to half that or less, according to Fish and Wildlife Service analyses. Large oil companies may keep spending the money to install netting over pits and take other steps. But former Fish and Wildlife Service agents said the biggest risk could be from small companies. It likely will be impossible to know how many more birds might die in oil pits or from other industry activity as result of the Interior Department’s decision. Only a small fraction of dead birds are ever found. From 1992 to 2005, Pepper Trail, a Fish and Wildlife Service ornithologist and forensic scientist, analyzed more than 2,000 birds representing 172 species that died in oil pits. But now, given the new solicitor’s opinion, he said he doesn’t expect any more oiled birds to arrive in his lab because their deaths no longer will be investigated. Mowad compared the new interpretation of the Migratory Bird Treaty Act with doing away with speed limits. A pied-billed grebe floats on an oil-covered evaporation pond at a commercial oilfield wastewater disposal facility in 2006. This story was edited by Marla Cone and copy edited by Nadia Wynter and Nikki Frick.